Lots of people want orthodontic treatment, but are concerned about having noticeable metal brackets and arch wires on their teeth. This is particularly true for adults who wish to undergo treatment, but fear enduring the “brace face” look. Fear not. We offer treatment with Invisalign®, an alignment system that makes esthetics a top priority. Treatment begins with models of your teeth, which are sent to the Invisalign® lab so a series of custom aligners can be made just for you. Although dentists and orthodontists offer Invisalign® treatment, an orthodontist is a specialist who attended two to three years of additional training after graduating from dental school to learn about tooth movement, upper and lower jaw relationships, facial esthetics and the best treatment techniques. 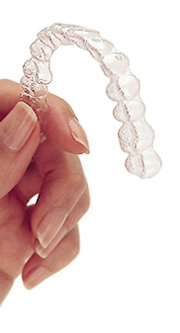 Invisalign® treatment involves the use of a series of clear, plastic aligners that are virtually invisible when worn. Each aligner is worn for about three weeks, at which time you return for an office visit. Dr. Tsintolas checks your aligner wear, teeth and bite to confirm that treatment is progressing as planned. He evaluates the fit of the next set of aligners, delivers them to you, and the cycle begins again. Dr.Tsintolas is an orthodontic specialist and he will closely oversee your Invisalign® treatment; he offers the supervision that other providers often do not. In addition to being unnoticeable to others, Invisalign® aligners can be removed for key moments, such as photos and speaking engagements. Invisalign® requires no dietary restrictions, because the aligners are removed before meals. Wearers don’t have to worry about getting food caught in their orthodontic appliances. Because they are removable, those who are in Invisalign® treatment also can continue their normal oral hygiene routine. It is important to note that Invisalign® is not ideal for every orthodontic case. You also might want to keep this in mind: although dentists and orthodontists offer Invisalign® treatment, an orthodontist is a specialist who attended two to three years of additional training after graduating from dental school to learn about tooth movement, upper and lower jaw relationships, facial esthetics and the best treatment techniques. An orthodontist is superbly equipped – both with skill and the necessary diagnostic experience– to perform a complete evaluation of your teeth, jaws and supporting bone structure and develop a treatment plan that will best address your unique needs, whether that is with Invisalign® or another treatment modality. As you proceed through your Invisalign® treatment you are secure in knowing that a specialist is actively overseeing your care and monitoring your tooth movement, your bite and your facial esthetics. Please contact our office for a complimentary consultation and learn whether you are a good candidate for Invisalign®.